Redlands United affirmed their Final Series aspirations following a 1-0 win over Palm Beach SC at Cleveland Showgrounds on Saturday. Player-coach Graham Fyfe delivered his ninth goal of the season early in the second half to seal the points for the hosts, who recorded only their second clean sheet of the 2015 campaign. The result moves the Red Devils three points clear of Sharks in fifth place on the table behind Brisbane Roar Youth, who are ineligible for the top four PlayStation 4 NPL Queensland Finals Series. Early chances fell to Palm Beach, however Ethan Grimley was unable to take full advantage as he twice shot over the crossbar. The first clear cut chance of the match for the hosts resulted in a tame headed effort from Elliott Ronto on the quarter hour before goalkeeper Brendan White denied Sharks’ duo of Rees Duncan and Roman Hofmann in quick time with a pair of telling stops. Lyndon Dykes proved lively at the top of the Red Devils formation and forced a sharp save from Sharks’ goalkeeper Shane Viitakangas immediately prior to the half-hour, before Grimley again shot over the bar to ensure the teams remained deadlocked at half-time. Further chances followed for both sides after the restart as Sharks’ Lachlan Reus and Fyfe both called the goalkeepers into action. However, it was Fyfe that eventually broke the stalemate with a long range strike from distance just prior to the hour - his first goal against Sharks since the 2013 campaign. Dykes spurned a pair of chances to double the host’s advantage shortly after, while Duncan failed the make the most of chance to level terms at the other end. Substitute Josh Riis provided an immediate impact as he forced a full-stretched save from White with a quarter hour remaining before Fyfe was denied his second by a goal line clearance from Kristian Rees. The visitors finished strongly as they searched in vain for the equaliser - including Viitakangas heading wide from a late corner kick in a rare attacking foray for the gloveman. Sharks frustrations boiled over after the final whistle as Reus was shown a straight red card following a colourful post-match exchange with the referee. Speaking post-match, White said he and his teammates were determined make amends for their loss against Sharks earlier this season. 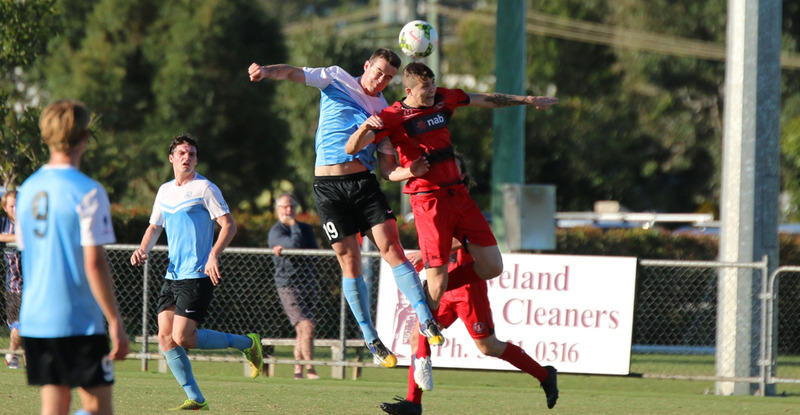 “We lost one-nil to them down at Palm Beach so we really wanted to turn the result around and we did today just really putting together a ninety minute performance,” he said. Despite the final result Sharks coach Grae Piddick couldn’t fault his side’s application and said he was confident ahead of next week’s fixture against Sunshine Coast FC. “If we play like we did today and just fix a few things we can definitely win games - it was one of our best performances,” he said.